Detail : Paul's sixteenth solo single. With "Speed of Sound" dropping down the album chart (out of the top ten in July), another single was released from it to boost sales. It had the desired effect, and in August returned to the top 10. In fact it ended up being the fourth top-seller of 1976. Once again, the single shot almost to the top, this time kept off the top slot by Abba's "Dancing Queen". Sister Suzie, Brother John (Lennon ! ), Martin Luther (King), Phil and Don (The Everly Brothers), Brother Michael (Mike McGear), Uncle Ernie and Auntie Gin (Paul's relatives). "Let em in" was covered by soul singer Billy Paul in 1977, where it reached No. 26 in the U.K. chart. There was also a song by the same title reached number 70 in 1993 by Shinehead. 25 years later the song was remixed to promote "Wingspan"
And it was sampled and used to underpin Lulu's excellent "Inside Thing" for her 2002 "Together" album. 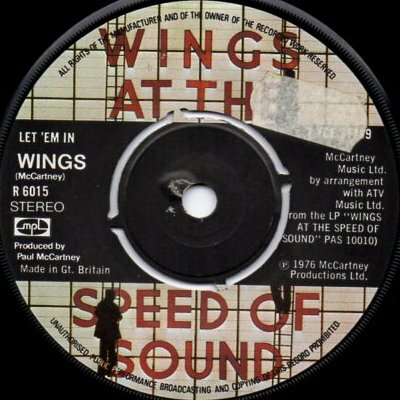 The single was not released in a picture sleeve, had no mention of a label, and once again had the "Speed of Sound" label. catalogue number - 2C 052 98062 Y (see below). 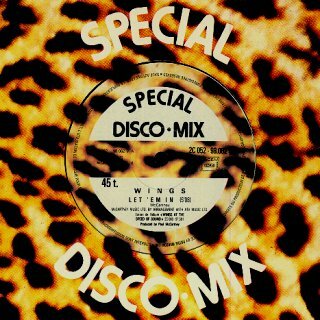 It has leopard skin cover and label, and identifies A & B sides as being "Special Disco Mixes". But they are the standard length songs, and the only thing "special" about the mixes is the extra depth of sound that the 12" single offers. Let 'em In - French Import 12"